การเปิดปิดช่องไอออนโดยตรง ดัดแปลงจาก Lumpkin et al. ↑ "mechanoreceptor", Concise Oxford English Dictionary (8th ed. ), United Kingdom: Oxford University Press, 1990, n. Biol. 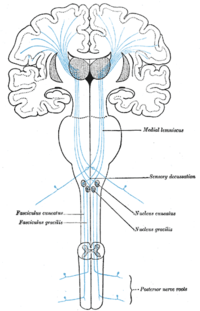 a sensory receptor that responds to mechanical stimuli such as touch or sound. ↑ Purves et al 2008, Glossary, pp. 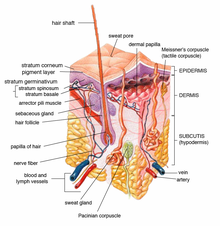 G-8 "Meissner’s corpuscles - Encapsulated cutaneous mechanosensory receptors specialized for the detection of fine touch and pressure." ↑ "Mechanoreceptors". Kimball's Biology Pages. 2014-12-01. Archived from the original on 2017-06-27. ↑ Michelson, JD; Hutchins, C (1995). "Mechanoreceptors in human ankle ligaments". The Journal of bone and joint surgery. British volume. 77 (2): 219–24. PMID 7706334. Kandel, Eric R; Schwartz, James H; Jessell, Thomas M; Siegelbaum, Steven A; Hudspeth, AJ (2013). Principles of Neural Science (5th ed.). United State of America: McGraw-Hill. ISBN 978-0-07-139011-8.